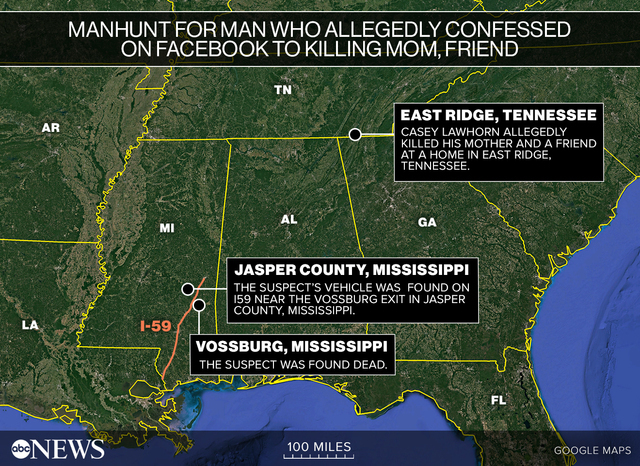 A multi-state manhunt has come to an end for a 23-year-old man who allegedly killed his mother and friend in Tennessee before fleeing and apparently detailing the alleged crimes in a disturbing Facebook post. Suspect Casey James Lawhorn was found dead in Vossburg, Mississippi, from an apparent self-inflicted gunshot wound, the Jasper County Sheriff's Office said Monday morning. Lawhorn allegedly shot and killed his mother, Vi Lawhorn, and a friend inside his mother's home in East Ridge, Tennessee, early Sunday morning, authorities said. After the double killings, dispatchers received a call from a person they believed to be the suspect, said East Ridge Assistant Police Chief Stan Allen. The suspect allegedly said he had committed the crime and was going to kill himself, Allen added. There was no information on the motive, Allen said. The double killings sparked a massive manhunt for Lawhorn, whose car was found Sunday night on I-59 in Jasper County, Mississippi, according to the Jasper County Sheriff's Department. In a now-deleted Facebook post, Lawhorn allegedly wrote, "This morning, at around 01:30, I shot and killed my mother (Vi Lawhorn) and a close friend of mine... with a stolen .22 LR." Lawhorn allegedly confessed to shooting his friend once in the head as he slept. Lawhorn wrote that he "rapidly" fired two shots at his mother "but I missed anything vital since there weren't any lights on in her room. I saw 1 entry wound in her left arm, I'm not sure where the other one went." "She started screaming the worst scream I've ever heard. Movies really don't do justice to how true terror sounds," the post continued. "She shouted 'You shot me! You've killed me! Why?' Once I got the jam fixed, I turned on the light so I wouldn't miss again. I shot at her twice more and it was over." Lawhorn said he stole money from his friend's wallet and left the house. "The whole event took probably 3 or 4 minutes," he wrote. "I had hoped both were going to be quick and efficient. I didn't want my mom to suffer, to die in horror, to die with the knowledge that her son did it." In the apparent Facebook confession, Lawhorn said he was writing the post on the side of I-59 south in Mississippi after his car broke down. He concluded the post, "What I look forward to is the nothingness after death. I've spent a lot of time thinking about murder, wondering what it feels like. But I've barely felt anything." ABC News' Darren Reynolds and Rachel Katz contributed to this report.